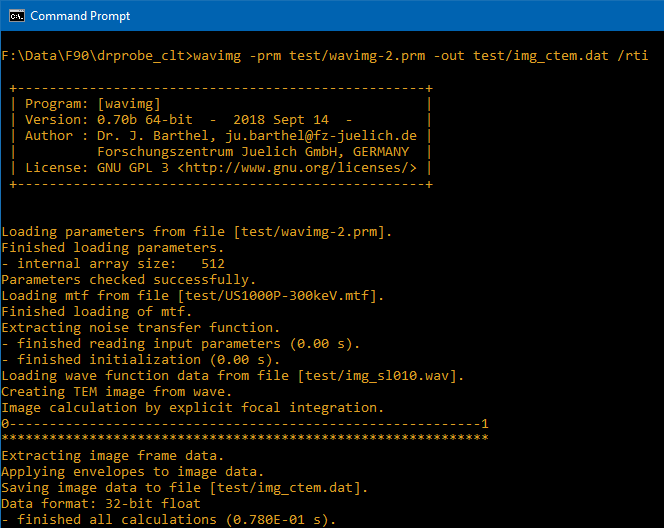 Use WAVIMG to calculate high-resolution TEM images from electron wave functions. The	program reads wave functions and outputs images or modified wave functions depending on the control parameter setup. Image-plane wave functions are calculated by applying electron-optical transfer functions, i.e. imaging aberrations and an aperture. The image intensity is calculated by taking the absolute square of the wave function and including the effects of partial coherence of the electron beam. The image contrast may be attenuated by a frequency modulated	detector transfer function (MTF) and vibration dampening. The program is compiled for single-thread calculations and can be called from command-line shell or from other programs on 64-bit operating systems (Microsoft Windows, Linux and Max OSX). The program is controlled via a parameter list provided in a text file and by calling options.